A chatbot (also known as a talkbot, chatterbot, Bot, IM bot, interactive agent, or Artificial Conversational Entity) is a computer program which conducts a conversation in natural language via auditory or textual methods, understands the intent of the user, and sends a response based on business rules and data of the organisation. In simpler words, chatbots are based on the AI-based technology using instant messaging to chat in real-time, with your customers or site visitors. People need real-time answers and chatbots help solve the issues in real-time. 2019 is the year when there will be a heavy surge seen in the adoption of chatbots. This will hold a central place in the digital marketing strategy in 2019. Marketers who do not want a drastic fall out of the leads from the funnel, surely need to start planning strategy for chatbot implementation. With 1.4 billion people interacting with chatbots, 80% of savvy businesses are already using or plan to use chatbots by 2020. 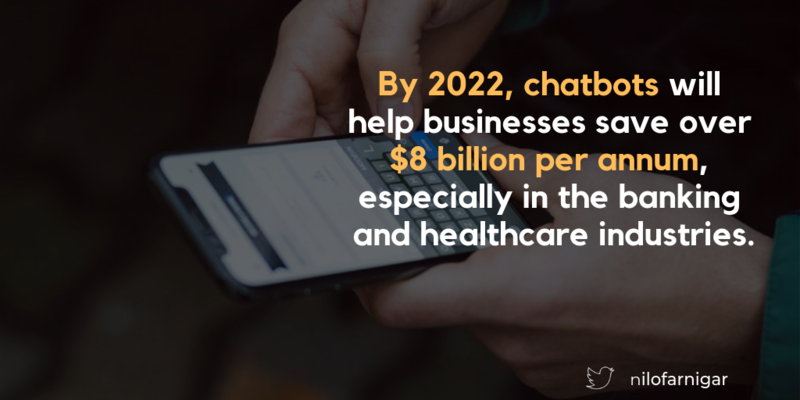 And by 2022, chatbots will help businesses save over $8 billion per annum, especially in the banking and healthcare industries. Many customers prefer interacting with chatbots as they are not intimidating, super responsive, give answers promptly, accurately recall your entire buying history, and never lose patience. Thus, while customer service is being taken care, companies can direct their focus to other areas of improvement. Uber uses chatbot technology to communicate with customers, making it easy for them to hire cars even on Facebook Messenger, from Slack or via Google Maps. Marketers argue that the likelihood of converting a lead is more when it comes to using chatbots as they shorten the buying journey as they bring the point of sale to the customers’ screen. We are seeing tremendous shift towards chatbots for everyday transactions majorly in the e-commerce transactions such as ordering a pizza or booking a taxi and it’s estimated that by 2020, chatbots will be used in 85 per cent of all B2C interactions.